You are currently browsing the tag archive for the ‘women’s fiction’ tag. You’ve Been Sweet To Me … So here’s a treat for you! As a reader, I love a good story and I know that you do too! 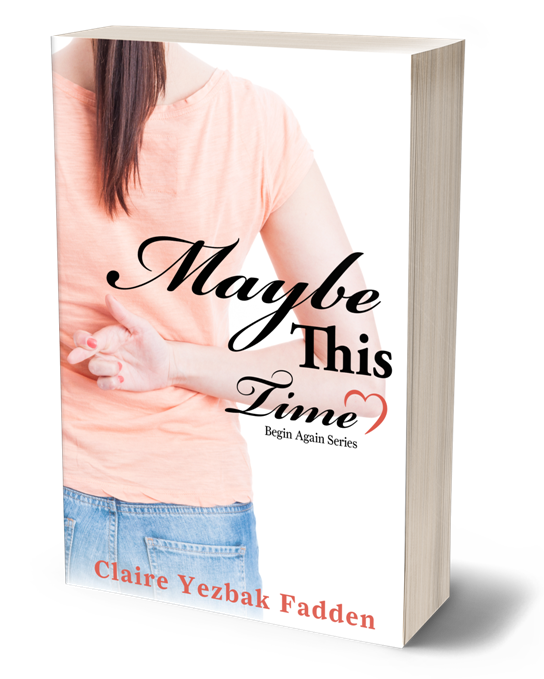 That’s why I’ve attached a link for a free ebook copy of Maybe This Time as a thank you for your ongoing support, enthusiasm and, well, just because you are you! The novella comes out this Friday, but you’re getting it first and for free! The Jameson sisters are at the center of my Begin Again series. You’ve met Monica Morgan in A Corner of Her Heart. I’m hoping you’ll enjoy this prequel about Kate, the youngest of the three. Her novel, Promises To Keep, is coming soon. And I haven’t forgotten about Julie Rafferty, the oldest sister. Her story, Playing Games, is coming in the fall. I’d love to hear from you. Email me at claire@clairefadden.com. ​Architect Kate Jameson has sworn off men. That is until she meets Eric, the handsome son of her current client. Fresh out of a messy relationship with a coworker, Kate’s not ready to trust her judgement where men are concerned. She dodges Eric’s advances, but can’t deny the attraction growing between them. Everything–especially his soul-searing brown eyes–makes her want to throw caution to the wind and try again. At her sister’s prodding, Kate finally agrees to date Eric, surprised at the joy he brings into her life. But when their budding romance is threatened, Kate is forced to make hard decisions and fight for her true happiness. ​Undercover CIA agent Eric Wiley has survived enough loss in his life to ever want to risk being hurt again. He has long since given up on true love. Still, he’s drawn to Kate in a way he can’t rationalize. Avoiding her isn’t working and for the first time in a relationship, he wants to be truthful about his past and his career. Before their romance can bloom, however, Kate goes missing. Recognizing the danger, Eric stops at nothing to rescue the woman who has captured his heart. Sharing little pieces of me with you. Supporting journalists across the San Diego region.